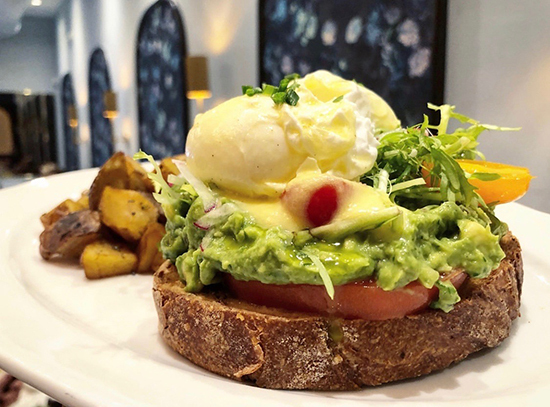 La Rue's version of Avocado Toast. Stating this weekend, La Ru Bistronomie will be serving their Sunday brunch on Saturdays, too. Both days the brunch is from 10:30 am to 3:00 pm. The brunch includes soups, oysters, omelettes and eggs prepared other ways, salads, sandwiches, steak tartare and lots more. There's a Prix Fixe brunch special for two that is $60. This includes one bottle of House Prosecco with Juice or Rose, plus two entrees (excluding meats) plus one sweet treat and coffee or tea. Brunch drinks include Mimosas, Bellini, Piscine and Rose Sangria, there are also cocktails like a Faux Mojito, Kir Royal and White Port chiller. They offer draft beer and lots of wine by the glass. La Rue is at 3145 Commodore Plaza.